Rose is no stranger to threats from Islamic fanatics. As culture editor at Jyllands-Posten, it was he that decided to run the infamous Mohammed cartoons that sparked off demonstrations worldwide and earned Jyllands-Posten and its employees death threats. In spite of that, Rose refused to support Wilders’ position on banning the Koran across Europe. Wilders said that history was exactly the reason that Islam should be eradicated from European countries. Danish anti-Islamist Lars Hedegaard was in the audience, having been escorted in at the last minute by police who had searched every attendee and maintained a massive presence around the Bornholm schoolhouse where the debate was held. 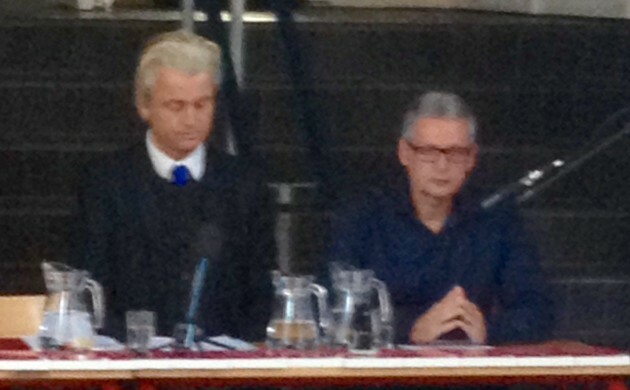 Wilders pointed Hedegaard out as one who knew the reality of Islamic terrorism. “He was nearly shot to death in front of his own home,” Wilders said. Wilders apparently saw no contradiction in saying he had no problem with “friendly Muslims” while still calling for a total ban on Islam throughout Europe. In perhaps his most bizarre comparison, Wilders used a quote by Abraham Lincoln, the US president most noted for freeing the slaves, to defend his reasoning for denying Islam any air in the Western World. “Those who deny freedom to others deserve it not for themselves,” he quoted. The two men took up the entire hour allotted for the debate, so there were no questions from the floor. Wilders was hustled out of the building by a wedge of armed security as soon as the debate was over.